There are certain food items that are simply obligatory to consume in considerable quantity this time of year. Take for example the humble Mince Pie. As a nation we eat a whooping 370 million pies in the run up to the Big Day. That's 27 mince pies each or the equivalent of 8,640 calories per person. Or the equivalent, in my sweet toothed world, of an average weekday in December. Even the most miserly bowl of morning porridge can be brightened by a gaudy string of tinsel casually tied around the bowl. Tinsel is not tacky. It's kitsch, fun and screams 'IT'S CHRISTMASSSS' way better than Noddy Holder ever did. A bit like Christmas jumpers. For the minute at least; 2014's fashionistas may have other sweater ideas this time next year. Make sure to pop a subscription to Vogue magazine on your Christmas list to find out (I'd be the worst person to advise on the latest fashion trends, I have a long held belief that my life would be infinitely improved if I could live each day in pyjamas). Think the quantity of sparkle used each weekend on Strictly and multiple by a thousand to add a little Christmas magic to any bake with a generous sprinkle of glitter. Be warned though, you'll be picking glitter off your soft furnishings until at least April. Any food item can be hastily formed into a Christmas themed shape. The supermarkets have latched onto this festive money-spinner in a big way: see ASDA's Christmas Crumpet Trees or M&S's Christmas Pretzel Stars. Meanwhile, the home baker armed with a variety of festive cookie cutters, flour, butter, sugar, a spoonful of syrup and sprinkling of cinnamon has a whole Christmas tree worth of decorative novelty festive biscuits at their disposal. Add booze. Copiously. The most humble of bread and butter puddings can be 'festive-fied' with a generous gulg of rum. A slice of toast this season isn't complete without a thick layer of whiskey marmalade. Forget whipping double cream to sandwich together your Victoria Sponges, use brandy cream for extra festivity. Think of the cupcake as a glorious blank canvas of Christmas creative possibilities. A cherry and a couple of pretzels and you've got yourself a Rudolph cupcake. A star nozzle and a few pounds of green icing and you've got Christmas cupcake trees. A generous spray of gold shimmer and cupcake baubles are all yours. 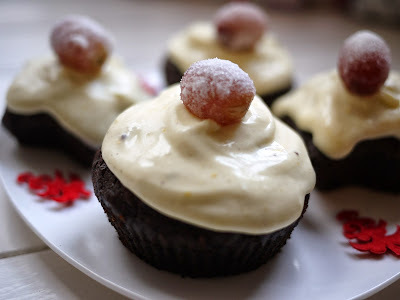 Talking of which, we tucked into some glorious Mulled Wine Cupcakes the other weekend, adapted from a recipe from the Hummingbird Bakery spotted in last month's Marie Claire magazine. I experienced mulled wine with cherries last night. Oh My Goodness. That's the way forward. They sound absolutely delicious and a drop or three of booze in the baking is bound to put a smile and a winter glow on anyone's face! 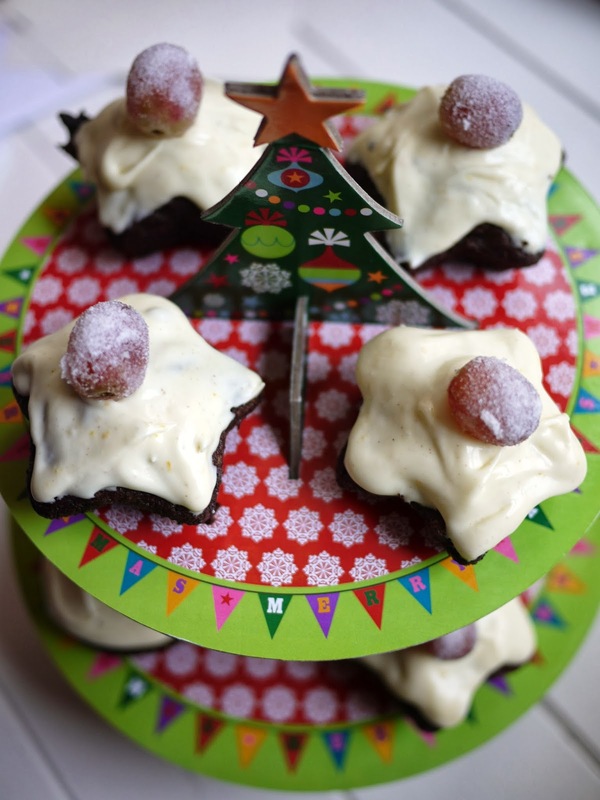 I love the spices of mulled wine, but have an issue with hot fruity drinks - you have solved my problem...put them in a cake! Genius! Oh yes I completely agree loving that mulled wine addition.